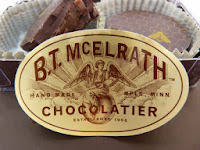 Today was Day #3 of Chocolate and Honey Theme Week, and I started the day with a 2-piece party favor sized package of two Chai-Spiced Honey Truffles from Brian T. McElrath (B.T. McElrath Chocolatier, Minneapolis, MN). These truffles possessed creamy, soft ganache (centers), flavored with a chai spice blend and Minnesota honey, and were enveloped by thick 70% dark chocolate exteriors. 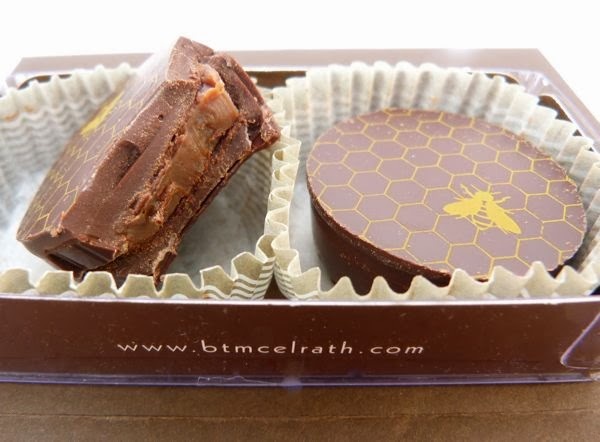 The truffles were decorated with a honeycomb + bee print across the top. This week I'm promoting not only chocolates with honey, but also our friends the honeybees. Bees have experienced tough sledding in recent years (diseases, mites, problems made worse by humans, and the usual weather and changing habitat challenges). Go bees! we're rooting for your ongoing well-being. We love your honey, and the fact that you are great pollinators for other foods we value.